PHILADELPHIA — If Adrian Gonzalez hadn’t hit Cole Hamels with that line drive in the fourth inning, the Sox and Phillies might still be playing. That’s how sharp Hamels looked before he left the game. 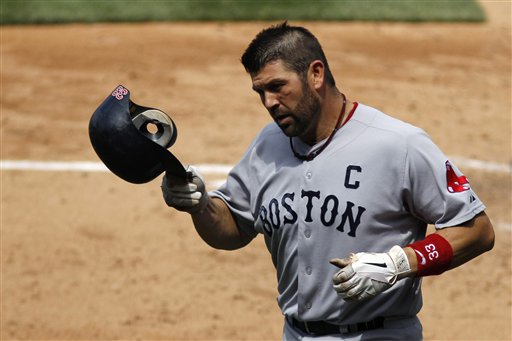 But the Sox scored five runs off the Philadelphia relievers and fled town with a 5-2 victory. Jon Lester (10-4) was immense, throwing seven shutout innings and allowing two hits. The best way to right a struggling team is with great pitching and he provided it. Lester is 2-0 with a 0.43 earned run average in three career starts against the Phillies, a statistic that could come into play if these teams meet again in the World Series. The gerrymandered lineup put together by Terry Francona somehow worked as Dustin Pedroia homered once and Jason Varitek twice. Pedroia has hit cleanup five times in his career and has home runs in three of those games. “Don’t tell me. Tell the manager, man,” he said. There was a bit of a somber mood in the clubhouse due to the release of Mike Cameron. While fans judge players on results, teammates look more at what kind of people they are and Cameron was universally popular. “Probably one of the best teammates I’ve ever played with, and that’s both on and off the field,” said Lester, a man not known for hyperbole. Francona was Cameron’s hitting coach in 1991, two weeks after he got drafted by the White Sox. The two were very close. It will be interesting to see whether Cameron retires or tries to hook on with another team. He looked done this season with the Sox but didn’t really get consistent at-bats. In a different situation, he could be a helpful player for a contender. The Phillies, for instance. On a personal note, Cameron was with the Mets in 2004-05 when I covered that team and he’s one of the top five best people I’ve had a chance to get to know in baseball. Guys like Cam make the job a little more fun and I appreciate all I learned about the game from him. Here’s hoping that his next step works out well.